Its that time of the year where I love to get out in my garden and start to spruce things up. 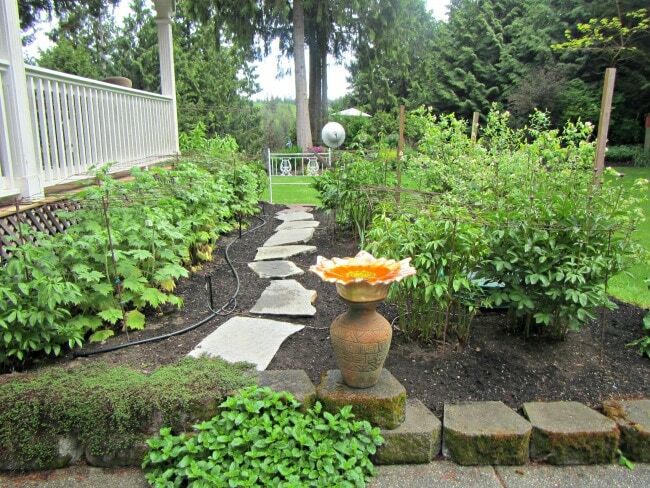 I am always on the look out for fun, and affordable garden art that I can bring in, and bird baths are one of my favorites. I love them because not only can they add beauty to your garden, but they attract some beautiful birds (and other critters sometimes as well). 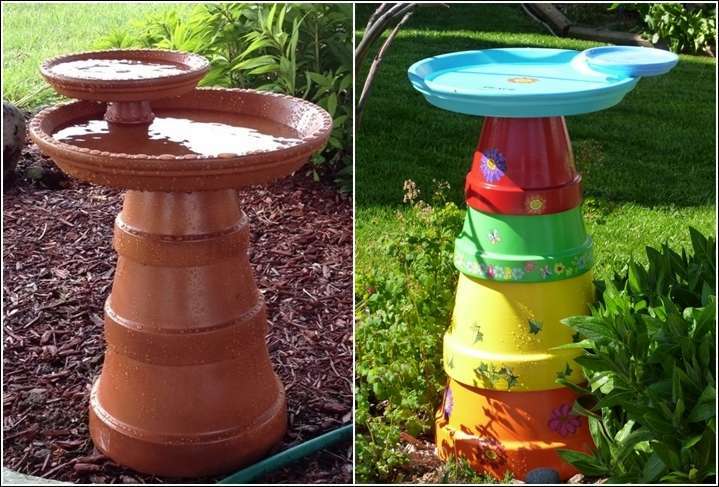 These bird baths are so easy to make, all you are doing is stacking pates on a large pot. This project is perfect for those who love to shop thrift stores or garage and yard sales. Look for deals on large potters, and large shallow bowls, as well as smaller decorative bowls. You can use pieces that might look tacky by themselves, but when they are stacked together in your garden they become art. 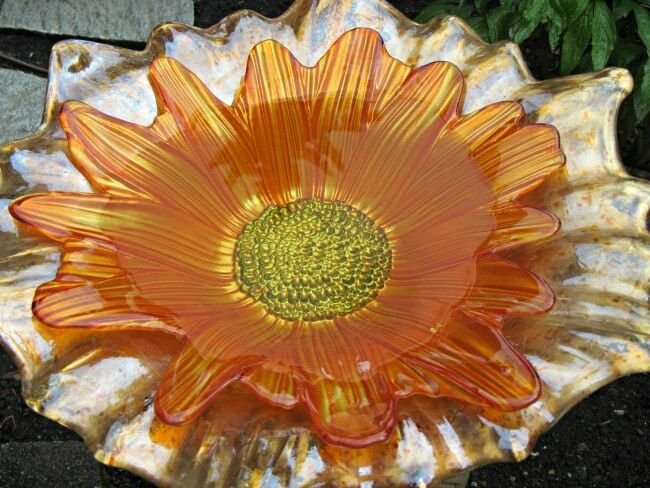 Older ash trays, or flower shaped bowls in glazes may not look that impressive sitting on a garage sale table, but stack them with another glass dish of a complimenting color and shape, and you end up with a beautiful birdbath, that not only will the birds love, but so will you. My mother recently made these simple bird feeders out of thrift store and garage sale finds. She simply stacks the dishes on her larger pots and adds water. She likes to change plates out for a different look from time to time, and so that is why she goes with the less permanent structure. If you have kids you’ll worry about knocking the plate (or pets) and want to make it more permanent, you can attach the plates to the top of your pot using an epoxy glue or gorilla glue. 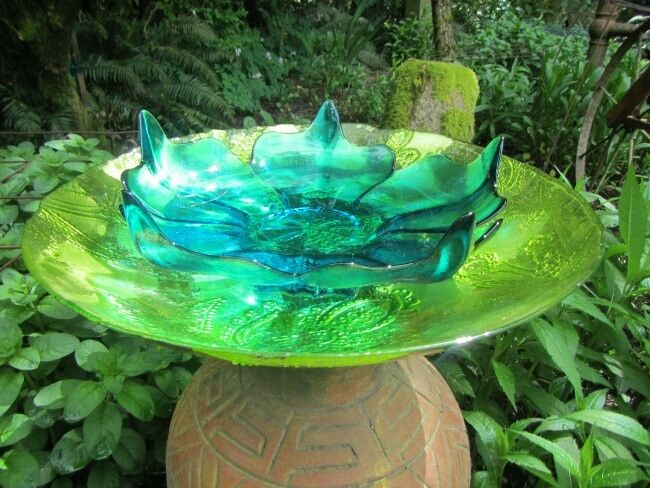 Rather then just putting one shallow bowl for the birdbath, like you often see, nest a smaller decorative bowl inside a larger one for added dimension. In this example, she found the large bowl at a thrift store for a few dollars. 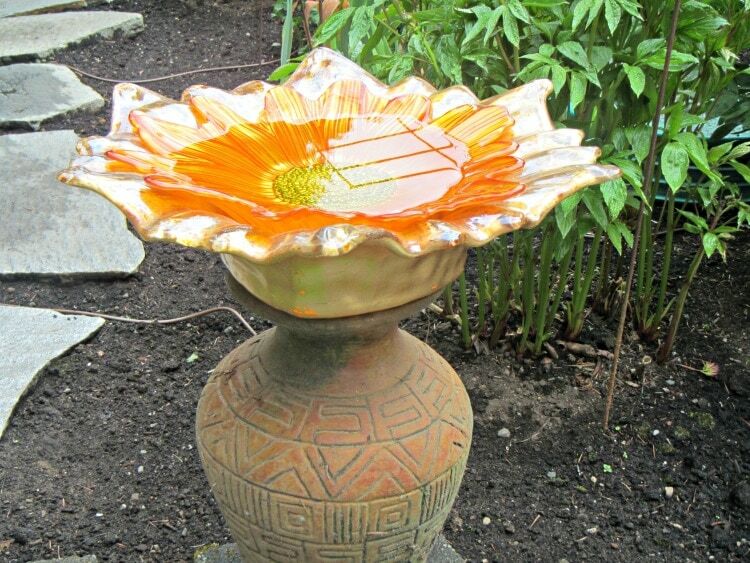 She then splurged on a $12 glass flower bowl from Home Goods Store, to make her birdbath even more beautiful. Using the same bottom pot, she is able to change out her dishes on top to get a completely new look, This green glass bowl has held fruit on our counter for years. It’s nice to give it new life in the garden. It looks like a completely new piece once the blue glass flower plate is stacked inside (which was not that pretty on its own). Be sure to search your own cupboards for old serving dishes, chargers or larger platters you are not using any more, and see how they might work on the top of a planter pot. If you do not have a pot to stack some large dishes on top of, you could grab some of these clay pots in different sizes and stack them to create your base. These clay pots can be very affordable, and you would just start by putting the largest size upside down, then stacking the smaller sizes on top. I would suggest using three like they did above, if you do not have a larger planter. If you use this method, you can either top them with the clay pot bottom, as they have, or just use the clay pots as the base for your birdbath, and then top if off with your glass dish finds like we have! 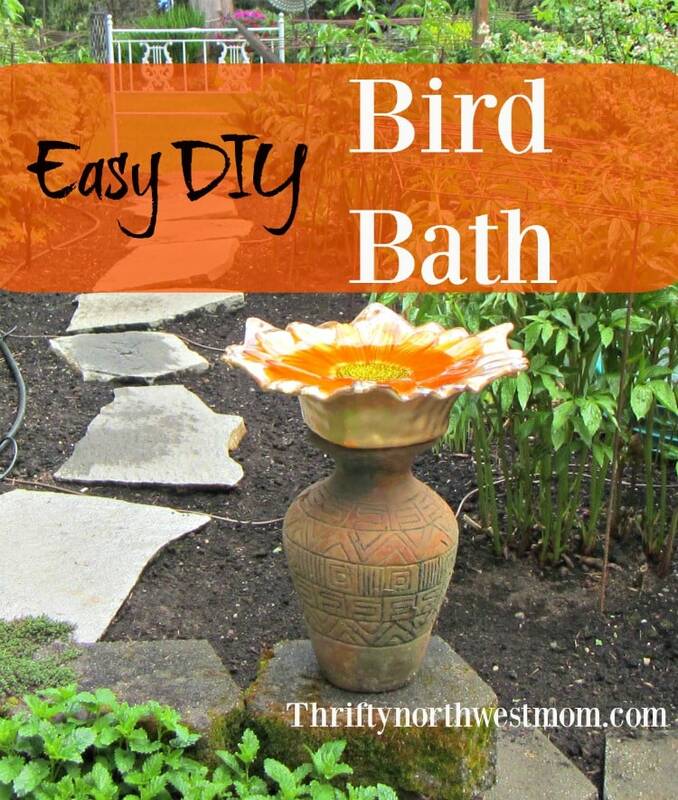 Have you made a simple DIY birdbath for your garden? We would love to see your pictures! 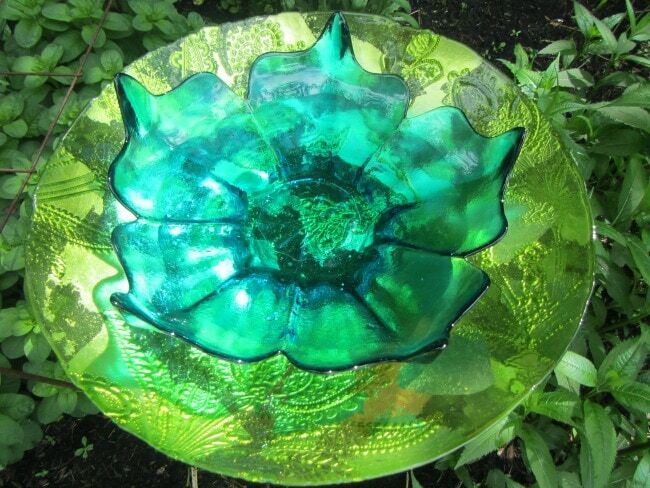 Using Glass Plates to Make Glass Flowers for the Garden! Planting a flower in a boot – such a cute keepsake!